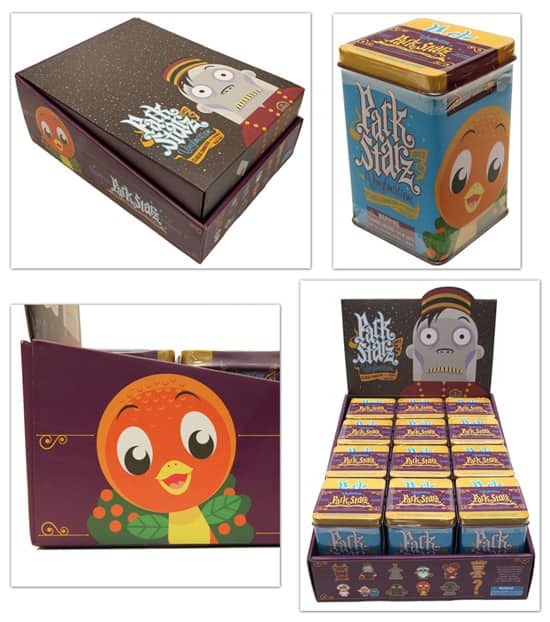 One of the more anticipated Vinylmation collections this year, Park Starz 2, arrives at Disney Parks on Friday, May 10. Introduced in September 2011, the first series featured uniquely shaped figures inspired by classic characters from Disney Parks. The second series has 12 new characters designed by Disney Design Group artist Casey Jones. I recently asked him about his experience working on this project. Each figure in this limited release mystery series is packaged in a collectible tin, which is sold either individually or in a tray. If guests purchase entire trays, they get all 11 known figures (as seen on the packaging) and the one mystery figure. Casey shared some additional insight into his designs. I had fun photographing this series. 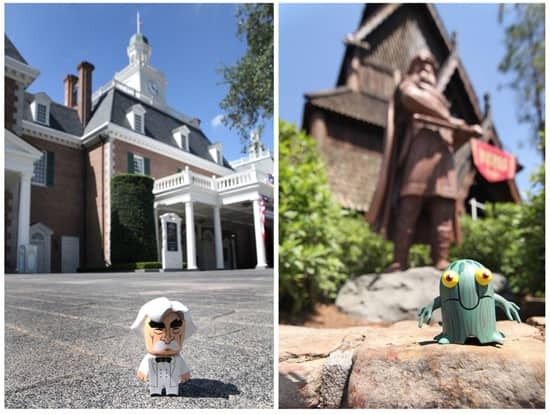 My favorite two images include the Orange Bird (someone had to eat that citrus swirl after the shot), and the Tapestry of Nations parade figure in Epcot. I loved that parade from the Millennium Celebration, and it appears Casey did too. The series will be released in the Vinylmation Store on Facebook on May 3. The series will be released at D Street locations in California and Florida on May 10. 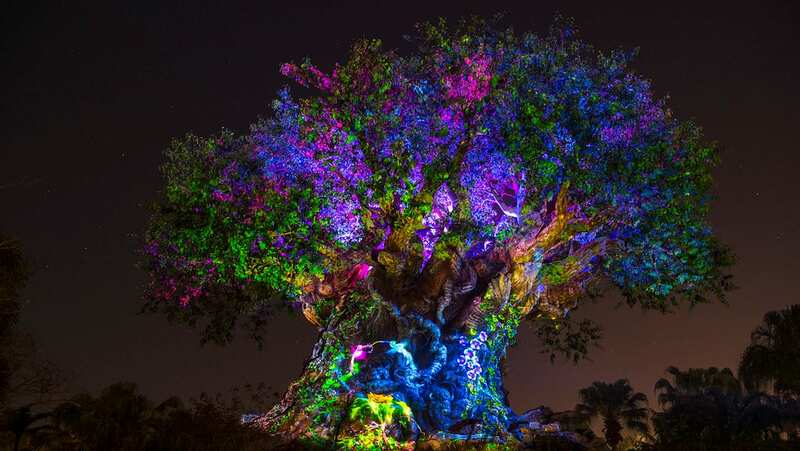 Casey will be meeting with fans at D Street in Downtown Disney West Side in Florida on May 10 from 5 p.m. to 7 p.m. When will we find out about variants? The Tower of Terror figure picture brings up a question. How can we get the skus/product numbers for HTH merchandise? I love that bell. I love Steven’s photography. 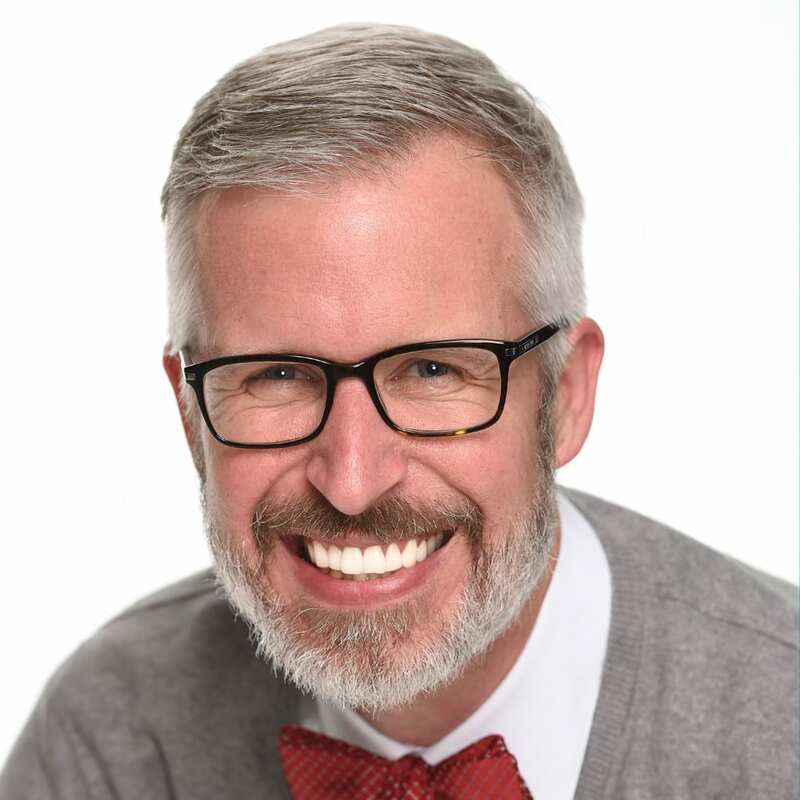 Steven Miller #1) has the coolest job and #2) his work is a Disney treasure to preserve! 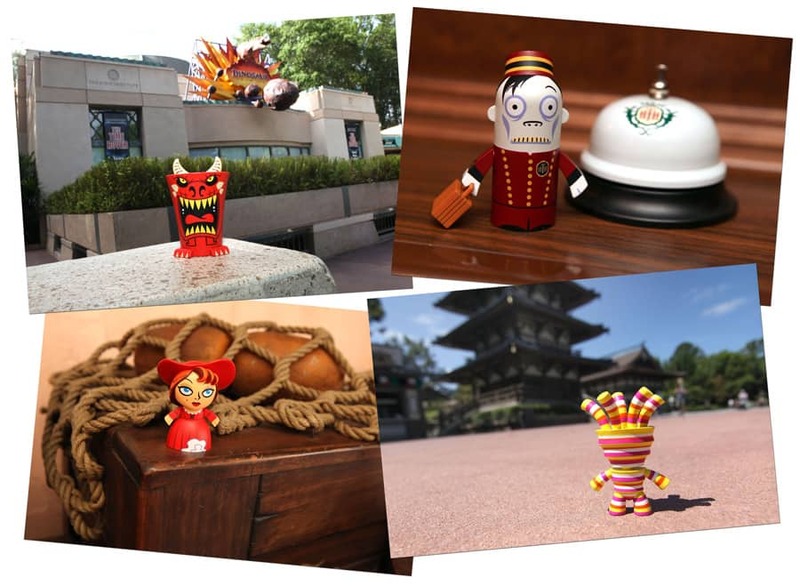 I love the Tower Of Terror vinylmation!! So cute! Do you know when the Beauty and the beast viynalmations will be available on the disney store website? What time will they be released at D Street at Disneyland? Store opening or 1PM like other releases? Also will there be wristbands or first come first served? Can’t wait to pick up a tray! Yes!!! Must Have The Orange Bird!! Steven, did you eat that Citrus Swirl? @David – Yes, and it was delicious! The perfect treat for a sunny Florida day. That Orange Bird is just TOO cute! Casey is ridiculously talented & such a genuinely nice guy in person. It’s the perfect blend of old & new. It’s nice to see the Orange Bird & the Disc puppet from Tapestry get the Park Starz treatment. I know I’ll be at D Street on Friday! I’m heading to the Disney Social Media Moms Celebration Thursday morning and I know a little Orange Bird is going to be hopping into my luggage! @Erin – How wonderful! I hope to see you this weekend. Have a safe trip. @Erin – And lunch. And dinner. 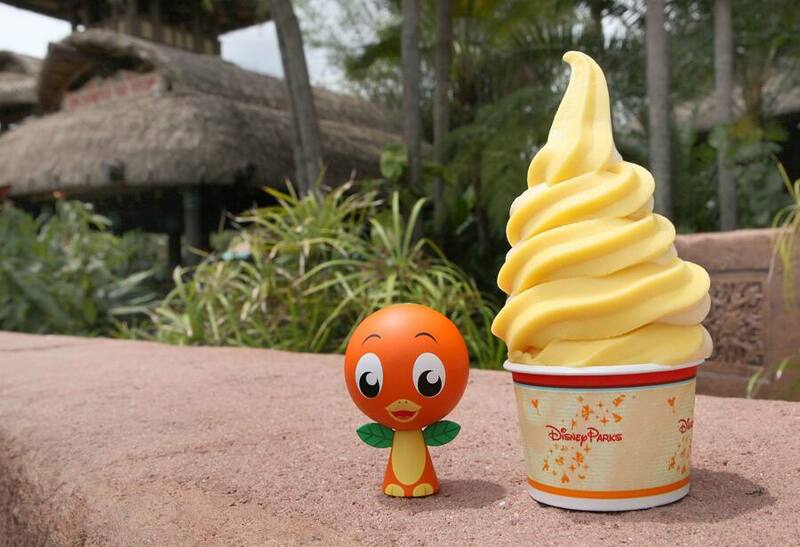 That citrus swirl looks soooo good. Such great photos Steven! I hope Orange Bird accompanies you to more photo shoots, he’s ADORABLE!!! (well, they all are, but him in particular) Casey & Thomas never disappoint. Is there a way to order these via the parks merchandise phone number? While i won’t make it down to WDW until December, I really need to pick up a couple of this series. The last time I checked the FB store, it required activating an app. I won’t shop the vinylmation facebook shop because I don’t enable Facebook apps as a general rule. If there were any other way disney could offer a vinylmation shop and NOT use Facebook, I’d be really very grateful. @Melissa – Our Merchandise Guest Services team is one option. If contacting them, please reference the following item number – 400007317536. @Bob – You’re welcome! I hope you have a safe trip to Florida this weekend. I love this set as much as the first series! Ordered a case on Friday through the facebook store and can’t wait for them to arrive! They will looks perfect next to series 1 and the variants! @Joseph – Right on! There will be limited edition variant figures coming for this series as well. Look for them to be released this summer. Like before, they will be packaged in tins.